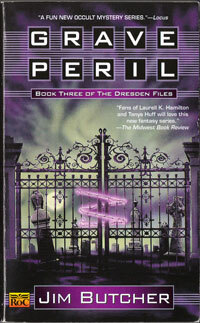 Storm Front and Fool Moon largely serve as introductions to the Dresden Files; Grave Peril is where the overarching plot thickens. Harry, along with newly introduced reoccurring character Michael Carpenter are trying to solve the mystery as to why multiple ghosts have been popping up all over town. Susan Rodriguez, Harry’s girlfriend and a reporter, wants information on what is going on. In order to get it she sneaks into a place that she should not be. This single event will start a plot line that still continues in book 11, Turn Coat. This book introduces the first of three antagonistic organizations Harry will continuously be dealing with. They are the Red Court vampires. These vampires can take on human shape, but are monstrous underneath. While there was a Red Court vampire in Storm Front, they officially become the enemy in this book. Harry accidentally causes a war between the Red Court and the White Council of wizards of which he is a member. The emotional level of this book is higher than the rest of the series. Harry’s desperation and trauma can be felt. While the entire series revolves around character interactions and Harry’s feelings for people, this book is an important step in understanding much of Harry’s character. He will do the right thing and damn the consequences. This book is also the first where you get a sense that there is overarching plot that Jim Butcher is telling, not just a series of minimally related stories. I was disappointed at first with this direction. The Dresden Files were different from other fantasy because they were not epic in scope. This disappointment wore off quickly though because each Dresden Files book is a self-contained story. There may be interrelated plot lines, but they take a background role to whatever Harry is doing at the moment. Some books may advance the overall plot, others may seem not to, but each is a great story on its own.